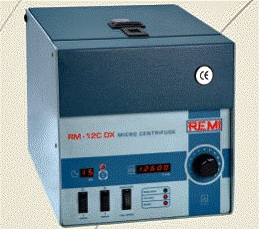 Biochemical And Clinical Labs, For Hematrocite, Corpuscle Percentage Contents In Blood, Serum Analysis And Precipitate Separation Etc.rm-12 Is The Basic Unit With Speed Regulator. Rm-12c Has Digital Speed Indicator & 0-15 Minute�s Digital Countdown Timer. 	Digital Speed Meter And 0-15 Minutes Digital Countdown Timer. 	Switch For Quick Acceleration To Full Speed.